This is my first attempt at a "blog" so please forgive me if it falls short of your expectations of what a poet thinks and writes. I know poetry is not very popular, in fact, lots of people hate it, say it is incomprehensible, but I don't think that is the case with mine. I try to write clearly so what I am trying to say is easy to understand. My granddaughter thought it would be fun for me to write about my poems, and why I wrote them, so this is what I am going to try to do. First of all I will tell you why I had the idea for the poem and then I will type it out for you to read and see if you like it. Then, since I like musing on daily events, I thought I would share with you something I saw or read in the newspapers which you might have missed, and which I thought was amusing. So I will write today's musing first. 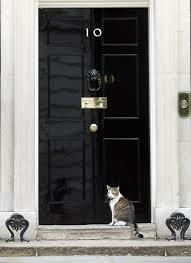 I t appears that Larry, the Downing Street cat, is not performing his mouse duties well enough. Yesterday, George Osborne, the Chancellor of the Exchequer, saw a mouse running over the sofa whilst in an important meeting in Downing Street. It seems that a colleague and George raced after it and trapped it in a paper bag before letting it out somewhere more suitable. Larry was not available for comment. and she was puzzled by mine. I wrote this poem when I got home and, when reading it at gatherings people often came up afterwards and told me their own stories, relating to the poem, and say they felt emotional when hearing me read it.